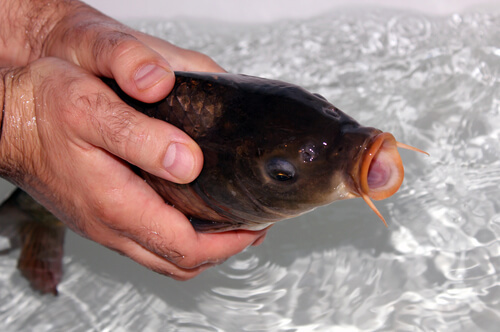 Gill Disease is an external infection which is common, particularly in warm water fish. As the name implies, it primarily affects the gills. Flavobacterium is the bacteria responsible for this affliction and will manifest itself with a large presence on the gills, resulting in mortality rates which can be as high as twenty percent if the condition isn’t quickly treated. Fish which have become infected will typically become lethargic, losing their appetite. If multiple fish are infected they will tend to congregate near the pond’s outlet. If the condition is acute, fish may succumb in as little as twenty four hours. When their gills are examined under a microscope intensive gill filament clubbing is often noted, as well as excessive detritus and mucus. Overall, this condition is very cosmopolitan in the manner in which it is distributed which means that every species of freshwater fish which are cultured are vulnerable, especially salmon. The disease may develop as a result of water which has become contaminated, or through carrier fish. Research has found a strong correlation between a large presence of fish in a given area and the likelihood of the condition developing. Specifically, ponds or aquariums which have too many fish are more likely to develop this condition than ponds where the fish population has a sufficient amount of space. In addition, some believe that certain chemicals, such as ammonia compounds or formalin, may predispose certain fish to this disease. No fresh water fish have been found to be immune or resistant to it. Incubation for Gill’s Disease can range from three days to three weeks, depending on factors such as the fish age, environment, and infecting organism virulence. The likelihood of acquiring this disease will increase during spring and the early part of summer. This is also the time of year when the younger fish are most vibrant, and when their feeding rates will increase, leading to crowding. The most important step in preventing this disease is maintaining a clean and non-crowded pond. Good sanitation must be maintained at all times, the water should be regularly cleaned and aerated, and the fish should not be overfed, as this contributes to increased waste matter in the pond which will quickly erode the water quality. Any fish which die or appear sickly should be separated from the rest as soon as possible. Once Gill’s Disease is present there are several compounds that can be used to treat it. Some of these include hyamine, Potassium permanganate and Roccal. In scenarios where hardness has reduced the effectiveness of these compounds, Purina Four Power may be used in amounts ranging from three to four ppm, in the form of hourly flush treatments. In Europe Chloramine is quite popular, but has become the subject of controversy in recent years due to possible carcinogenicity.